I an A.P. if S1 = T1 + T2 + T3 + T4 + ...........+ Tn ( nis odd ) and S2 = T2 + T4 + T6 + .... + T(n-1), then find the value of s1/S2 in terms of n.
Prove that the sum of n numbers of terms of two different AP's can be same for only one value of n.
This question is spinning my head.. Please help..
question is attached. Please send step by step complete solution. How many numbers are there between 200 and 800 which are divisible by both 5 and 7 ? The 3rd term of an GP is 4. Find the product of its first 5 terms. The sum of n terms of a sequence is an^2+bn , show that the sequence is an AP. Sum of the first n terms of an AP is 3n^2/2 + 13n. Find the nth term of the AP. If the sum of first 13 terms of an A.P., is 21 and the sum of first 21 terms is 13 . Show that sum of first 34 terms is -34. If the sum of n terms of an AP is 3n^2+2n, find its r^th term. 27. If the ratio of the sum of the first n terms of two A.Ps is (7n + 1) : (4n + 27), then find the ratio of their 9th terms. Insert six AMS between 15and -15. Find the sum of all 3-digit numbers which leave remainder 3 when divided by 5. Q1 Please answer the question in short cut but fundementally and step wize . I hardly able to understand your answer . Q2 Please answer the question in short cut but fundementally and step wize . I hardly able to understand your answer . Q4 Please answer the question briefly but fundamentaly and don't miss any step . I hardly understand your answers . Along a road lies an odd number of stones placed at intervals of 10 meters . These stones have to be assembled around the middle stone . A person can carry only one stone at a time . A man started the job with one of the end stones by carrying them in succession . In carrying all the stones he covered a distance of 3 km .Find the number of stones. The sum of four consecutive numbers in an AP is 32 and the ratio of the product of the first and the last term to the product of two middle terms is 7:15. find numbers. the ratio of 11th term to it 18th term is 2:3. find the ratio of sum of 1st five terms to the sum of 1st ten terms ? The 6th term of am AP is 16 and 14th term is 32. Determine the 36th term. If 8times of the 8th term of an AP is equal to 13 times of the 13th term, show that 21st term of an AP is zero. The sum of 5th and the 7th term of an A.P. is 4 and the 10th term is 46 . Find the A.P. 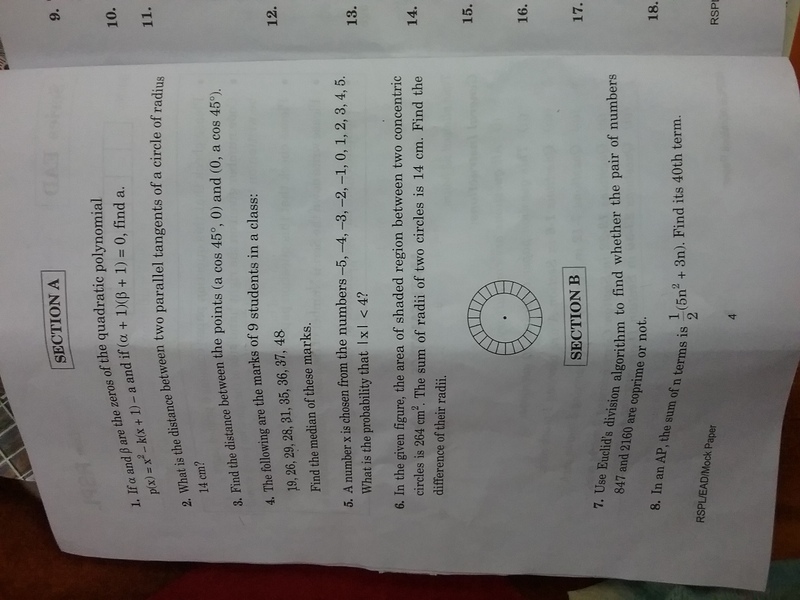 Solve Q no. 1, 2, 3, 4, 5, 6.
find the 20th term of AP whose third term is 7 and 7th term exeeds three times the 3rd term by 2 .also find the n th term. If an A. P. consists of n terms with first term a and n ^th term l show that the sum of the m^th term from the beginning and the m^th term from the end is (a+l). the first negative term of the sequence 14,11,8............... chapter A.P. Topic : GP Q5. The sum of 3 numbers is 63. If 2,7,21 are subtracted from these numbers in that order they form an AP. Find the numbers. 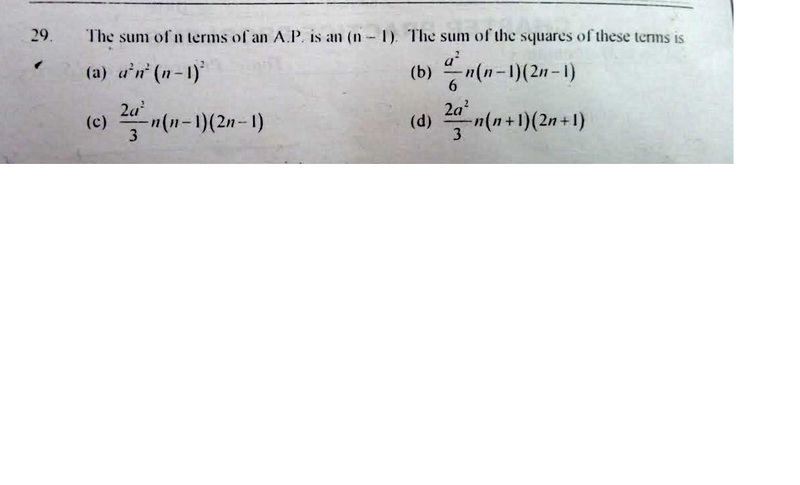 find the sum of first 15 term of an A.P whose nth term is 3-2n? Is 5,5,5,5,.... in A.P. form ? what is the common differnce of an ap in which a27-a7=84? 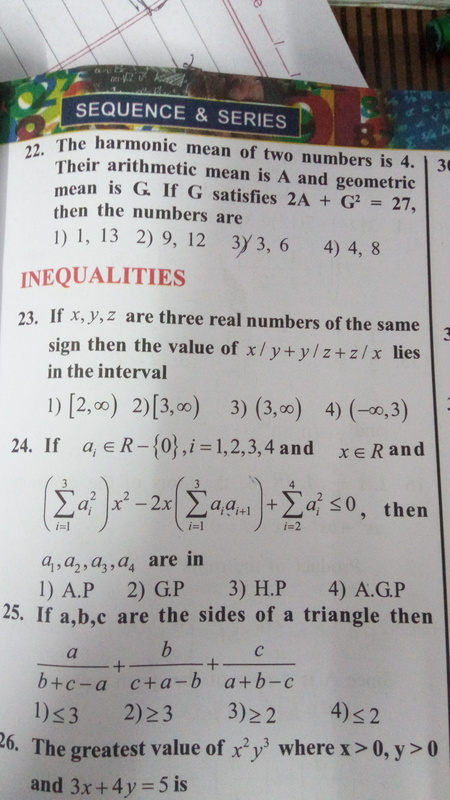 Could you please give the solution to problem number 20. What is the sum of n terms of a series whose mth term is 2^m + 2m? If alpha and beta are two arithmetic means between a and b then show that alpha + beta = a + b. 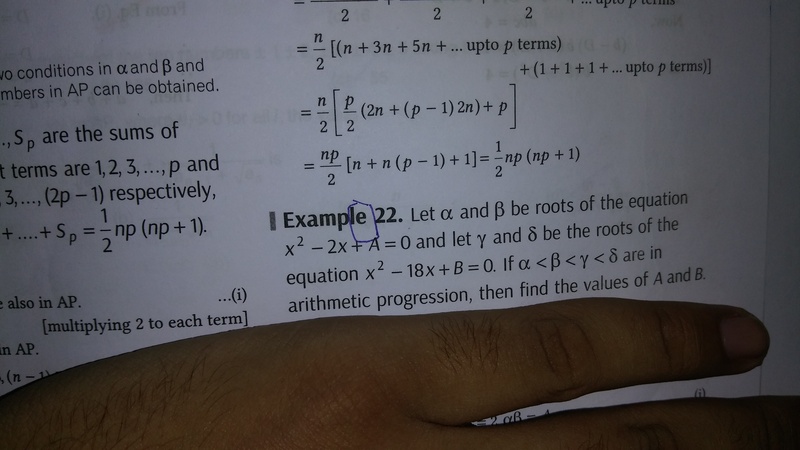 If a, b, c are in arithmetic progression then prove that ( a+2b-c)(2b+c-a)(c+a-b) = 4abc. There are n arithmetic means between 3 and 17. The ratio of last mean to the first mean is 3:1. Find the value of n.
Ram invests a total sum of 2000 rupees on government bonds in 4 years. If these investments are in A.P and the sum of squares of the investments is 1200000. Find the investment made by ram in each year respectively. It is also known that he always invest more than the previous year. Two men X and Y started working for a certain company at similar jobs on January 1, 1950. X asked for an initial salary of Rs. 300 with an annual increment of Rs. 30. Y asked for an initial salary of Rs. 200 with a rise of Rs. 15 every six months. Assume that the arrangements remained unaltered till December 31, 1959. Salary is paid on the last day of the month. What is the total amount paid to them as salary during the period? The measures of the interior angles in a polygon are consecutive integers. The smallest angle measures 136 degrees. How many sides does this polygon have? Q. Calculate the sum of the squares of first 100 terms of an AP , given that the sum of the first 100 terms is -1. and that the sum of 2nd , 4th, ......., 100th term is 1. If 7times of 7th term is equal to 11times of 11th terl,then what is the 18th term of that A.P? CAN I GET IMPORTANT QUESTIONS FOR ARITHMETIC PROGRESSIONS? What is the answer for this question? 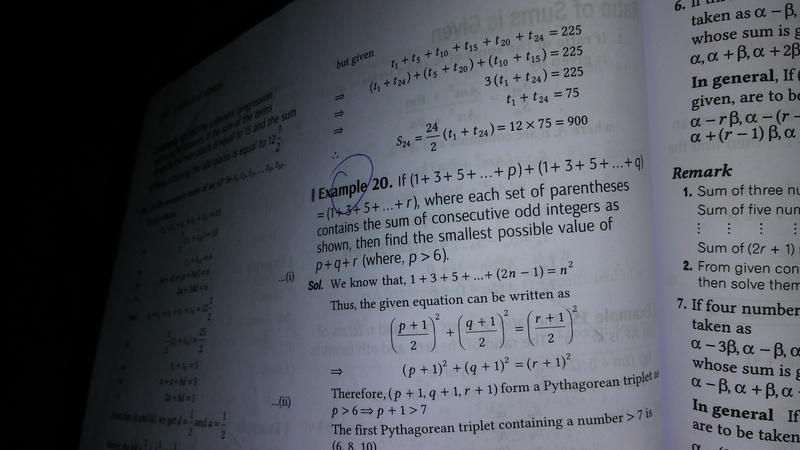 Page 231 If the pth term of an AP is q and the qth term is p, then prove that its nth term is (p+1-n) and hence prove that its(p+q)th term is zero. Page 255 Question 10 If the sum of n terms of an AP is 3n2+3n, find the rth term of the series. Sir pls solve this question. Evaluate 1-2-3+2-3-4+........+ up to 100 terms. 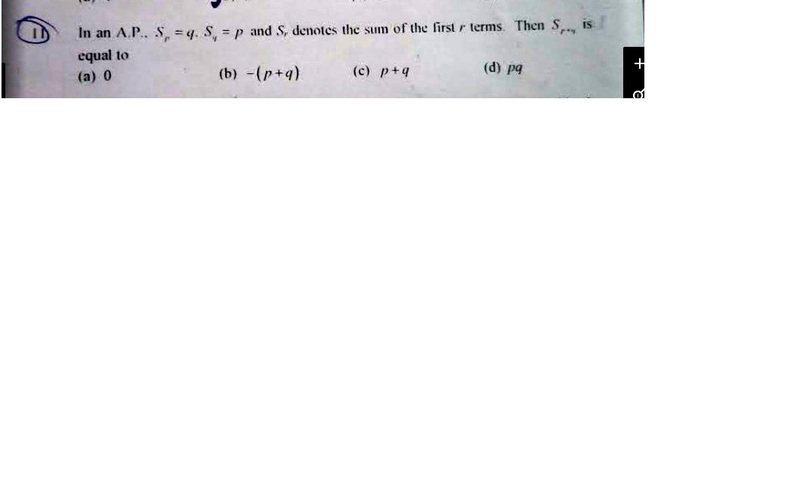 Sir pls solve the following. Find the sum of all natural numbers from 1 to 1000 which are neither divisible 2 nor by 5. The angles of a polygon are in A.P. with common difference 5º. If the smallest angle is 120º, find the number of sides of the polygon. The sum of the first six terms oa an AP is 42.the ratio fo the 10th term to 30th term of an ap is 1/3.calculate the first term and the 13th term. Kanika was given her pocket money on 1st Jan 2016 .she puts ₹1 on day 1,₹ 2on day 2 and ₹ 3 on day 3 and continued on doing so till the end of the month ,from this money into her piggy bank. She also spent ₹204 of her pocket money and was found that at end of the month she still has ₹100 with her . How much money was her pocket money for the month? A thief after commiting theft runs at a uniform speed of 50m/min. After 2min à policeman runs to catch him . He runs 60 m in the first minute and increases his speed by 5 m/ min every success given min . After how many mind the policeman will catch the thief ? There are two arithmetic progression, A1 and A2, whose first terms are 3 and 5 respectively and whose common difference are 6 and 8 respectively. How many terms of the series are in common in the first n terms of A1 and A2, if the sum of the nth terms of A1 and A2 is equal to 6,000? How do we find 6 arithmetic means between 15 and -15 ? 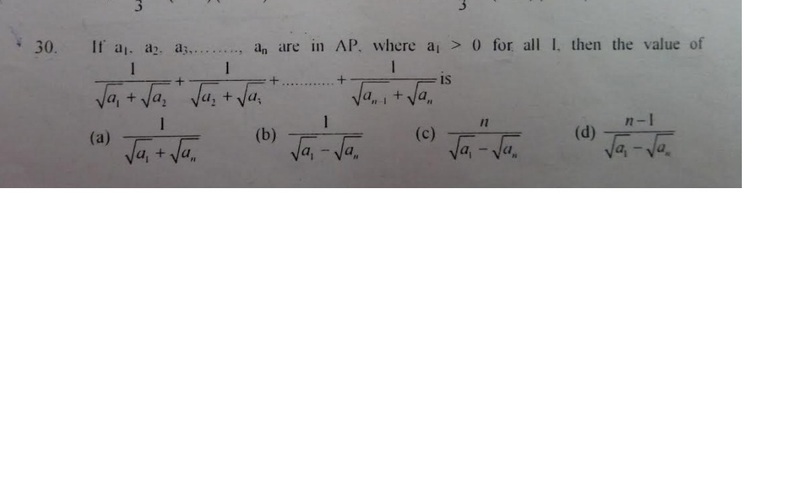 If a, b and c are in A.P., a, x, b are in G.P. whereas b, y and c are also in G.P. 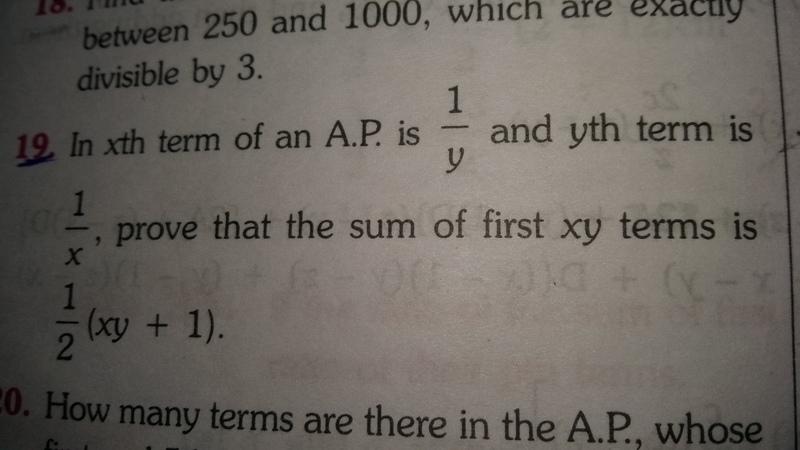 Show that x2, b2, y2are in A.P. In an A.P., if S6 + S7 = 167 and S10 = 235, then find the A.P., where Sn denotes the sum of its first n terms. Two cars start together in the same direction from the same place. The first goes with uniform speed of 10km/hr. The second goes at a speed of 8km/hr in the first hour and increases its speed by 1/2 km/hr each succeeding hours. After how many hours will the second car overtake the first, if both cars go non stop? In an AP of which ‘a’ is the Ist term, if the sum of the Ist p terms is equal to zero , show that the sum of the next q terms is -a (p+ q) q/(p-1). If the sum of m terms of an AP is equal to the sum of either the next n terms or the next p terms of the same AP prove that (m+ n) [(1/m)-(1/p)] = (m + p) [(1/m) -(1/n)] . A thief away from a police station with a uniform speed 100m/min. After 1 min a policeman runs behind the thief to catch him. He goes at a speed of 100m/min in 1st min and increases the speed 10m/min on each succeeding min. After how many minutes the policeman catches the thief. If there be m AP’s beginning with unity whose common difference is 1, 2, 3 .... m . Show that the sum of their nth terms is (m/2) (mn -m+ n + 1). the sum of first n terms of an AP . if its mth term is 168,find the value of m.also find the 20th term of the AP. How many terms of an AP 9,17,25.... must be taken to give a sum of 636? If we are asked to find out number of terms between 4 to 200 divisible by 4 .then whether we will include 4 and 200 in the list of AP formed or not? If the sum of the first 𝑚 terms of an AP is 𝑛 and the sum of first 𝑛 terms is 𝑚. Then, show that the sum of its first (𝑚 + 𝑛) terms is −(𝑚 + 𝑛).
. If the ratio of sum of 𝑚 terms of an AP to sum of 𝑛 terms of the same AP is 𝑚2 / 𝑛 2 , then prove that the ratio of its 𝑚th and 𝑛th terms is 2𝑚 − 1 ∶ 2𝑛 − 1. If the sum of first m terms of A P is n and sum of first n terms of the same A P is m. Show that sum of first (m+n) terms is -(m+n). Sent fast. The sum of the first three numbers in an arithmetic progression is 18. 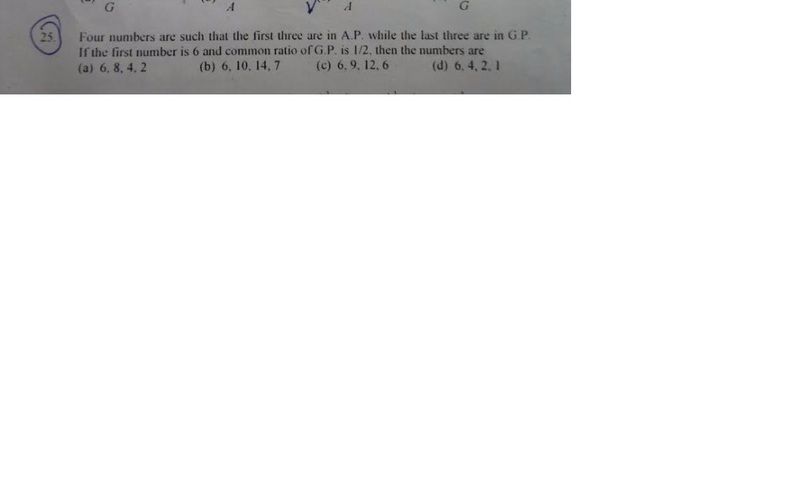 If the product of the first and the third term is 5 times the common difference, find the three numbers. The sum of first 7 terms of an AP is 49 and that of first 17 terms of it is 289 . Find the sum of first n terms .